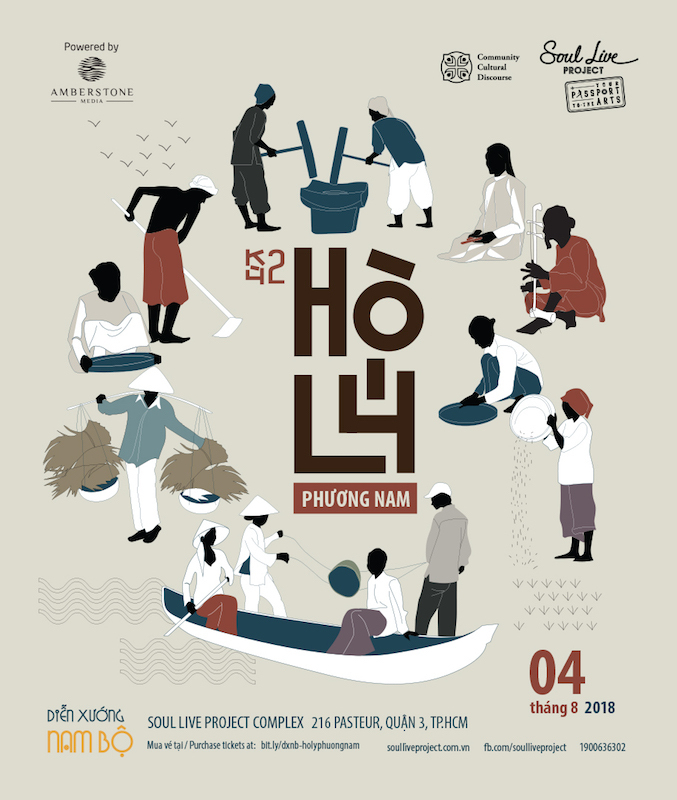 On August 4th 2018, the Vietnamese traditional arts series, “Dien xuong Nam Bo”, will be back with “Chapter 2: Ho Ly Phuong Nam” at Soul Live Project Complex (216 Pasteur, District 3, HCMC). Co-organized by Amberstone Media and the Cultural Community Discourse (CCD), the show will bring the audience to the Southern land of Vietnam through sweet and rustic melodies of the two refined Southern folk arts of “Ho” and “Ly”. Back in April 2018, SLP SERIES – a series of monthly community-based performing arts events, introduced “Dien xuong Nam Bo – Chapter 1: Khay Nhip Tang Tinh”. It was favourably received and enjoyed positive feedbacks from experts and the audience for the insightful talks on the overall knowledge of the formation and development of Southern Vietnam’s culture throughout 400 years. To uphold the tradition, Chapter 2: “Ho – Ly Phuong Nam” will bring the audience a truly immersive experience of “Ho – Ly” – two traditional performing art forms that have become important parts of Southern inhabitants through many generations. In addition to the the research-based sharing of our featured guest speaker, the audience will get to enjoy mesmerizing performances of “Ho – Ly” by traditional artists as well as participate in numerous interesting traditional games. For generations, “Ho” and “Ly” have become food for spiritual nourishment to Southern inhabitants and become a special cultural feature of the Southern land. Stemming from the daily labour life, “Ho” has become a part of Southern people’s daily lives. On the long days of working on the fields or leisurely rowing through rivers, our ancestors sang melodies of “Ho” as a way to relax, to ease the tiredness. It can be a confession of love, or a very romantic and casual poem. Besides the sweet melodies of “Ho”, there are joyful, witty rhythms of “Ly” which tell stories of the Southern people’s lives in different settings: “Ly” on the ricefields, “Ly” in the pond, “Ly” for playing games, “Ly” in ceremonies, “Ly” for confessions. They not only help to boost their mood and enthusiasm for agricultural work but can also be used as a matchmaker for couples. Unlike “Ho”, “Ly” is not associated with working movements or romantic improvisation. The nature of “Ho” is mood boosting so it must keep the rhythms, push and create a dynamic atmosphere in working time. “Ly” is usually performed by a group of people, like a choir. Therefore, “Ly” also has steady melodies and lyrics whereas “Ho” can be improvised with either short or long sentences depending on the singer. In the mid-twentieth century, due to the consequences of war, “Ho” and “Ly” gradually lost their appeal in the South. With the rustic, joyful, liberal, storytelling lyrics, about the love for family, homeland and the beautiful virtues of Vietnamese people… “Ho” and “Ly” used to inspire many songwriters when writing songs about the South. Despite the fact that it has contributed greatly to the legacy of Vietnamese folk music, it has unfortunately lost its place in the daily life of the Southern region. In regards to the future of traditional arts, Assoc. Prof/ Ph.D Nguyen Thi My Liem shared: “I think the future of traditional music should be a mutual concern for all of us. Because when people are still concerned about it, it means that they still bear the love for our heritage, about traditional music, and it will stay. Only when people turn their back on it, and none feels the pain of losing our legacy, it will fade into oblivion. It is heartening that many people are still concerned about traditional music today, so I believe it will live on”. To bring the audience closer to traditional art culture, this program will introduce “Ho” and “Ly”, express the anxieties about traditional music in modern social context as well as the aspiration to connect traditional music to the flow of contemporary arts through research-based sharing of guest speaker, Assoc. Prof/ Ph.D Nguyen Thi My Liem. The program also features traditional artists including the band, Don Ca Tai Tu – Sau Hung, and Singer Tanh Linh, whose voice has been described “as sweet as sugar cane”. They all want to share the values of national identity, as well as inspire the love of traditional music to the audience. The first 20 people who visit the event wearing “bà ba” shirt (a traditional southern Vietnamese costume) or “ao dai” will receive a surprise gift! What are you waiting for? Let’s get on the boat and travel all the way back to the origins of traditional culture with the lovely melodies of Southern “Ho – Ly”! With seniority in training and teaching traditional music at the Ho Chi Minh City Conservatory of Music, Assoc. Prof/Ph.D Nguyen Thi My Liem has devoted half of her life to the traditional music scene of the country. She also initiated and participated in many research projects on Southern folk music arts forms, including Southern “Ho – Ly”. She has received numerous awards from the Vietnam Musicians’ Association and the Association of Vietnam Folklorists, and is currently making efforts to put traditional music into the general education curriculum. Some researches and publications of Assoc. Prof/Ph.D Nguyen Thi My Liem include: Traditional Vietnamese Music Curriculum; Vietnamese Festival Folk Music in the South Monograph; Contribution to the study of the Southern Don Ca Tai Tu Monograph. The SLP Series is our brand new project in 2018. Powered by Amberstone Media, it is a series of monthly community-based performing arts events, with a variety of genres, including: CLASSICAL MUSIC – JAZZ – WORLD MUSIC – THEATRE – POP MUSIC – ALTERNATIVE INDIE/ROCK MUSIC – TRADITIONAL ARTS – DANCE. Anyone who is interested in or loves the performing arts can visit SLP to experience a myriad of different art forms. With this project, the SLP offers the community the opportunity to travel the world of arts and taste the various genres and styles.